Although chain hotels change hands frequently, generally speaking they rarely undergo extensive makeovers. In fact, in some cases the only change you can readily detect is a new name on the front door. Gladly that’s not the case with Capitol Reef Resort (www.capitolreefresort.com), as this upscale property boasts an impressive list of renovations, both inside and out. From the adobe facade and the western furnishings, to the teepee near the horse corral, this former chain hotel simply oozes western charm. Of course access wasn’t overlooked in the renovation either, and the property also offers a variety of accessible rooms. 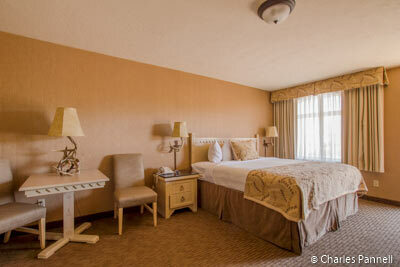 Room 401, which is located at the far end of the parking lot, is the most accessible choice. There’s accessible parking in front of the room, with level access to the front door. 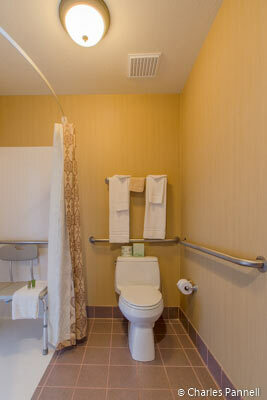 Access features include wide doorways and plenty of room to navigate a wheelchair. The spacious room is furnished with a 28-inch high king-sized bed with good pathway access on both sides, and a table with two chairs. It also includes a microwave, a refrigerator and a wet bar. 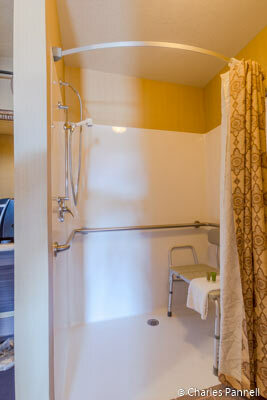 The bathroom has a full five-foot turning radius and it’s equipped with a roll-in shower with grab bars, a hand-held showerhead and a portable shower chair. 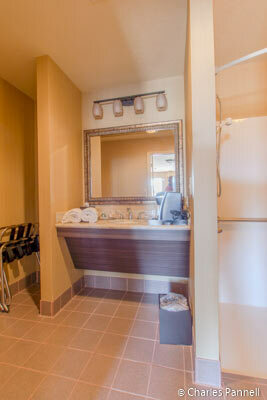 The toilet grab bars are located on the left and back walls (as seated), and the bathroom also has a roll-under sink. Add in some lowered robe hooks and you have a nicely accessible room. There’s also barrier-free access to all the public areas of the property, including the restaurant, which serves up a full hot buffet breakfast every morning. And as an added bonus, Capitol Reef Resort is located just a mile west of Capitol Reef National Park; and with no hotels in the park, it’s the most convenient lodging option for park visitors. In the end, Capitol Reef Resort is a real find, and a huge step up from its former incarnation. And thanks to an attentive and efficient staff, you’ll have a very accessible and relaxing stay at this newly renovated property.